Art therapy is not about making “good art” it is about opening up to the creative process. This is an opportunity that requires us to be brave and open and not judge ourselves. In this process we practice letting go of our desire (or need) for control. Learning how to let go of anxiety through an art therapy session is different from other therapy because the process is both relaxing and fun. Art therapy is NOT about being good at painting but rather about being free and honest with yourself. 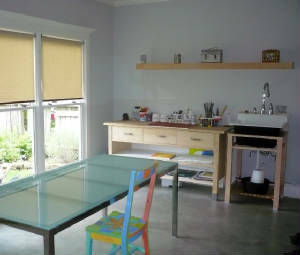 The art therapy studio is a beautiful space with lots of natural light. It is a room where you won't be afraid to get messy and be yourself! An image has the ability hold many ideas at the same time. This is very different from language, which states one idea at a time. For example, the images below represent different ideas. Notice how complex they are when you think about the idea the artist is expressing. 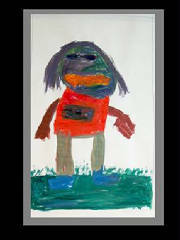 Art therapy can help people learn to work together. This mural was created by a group of 8 adolescent boys in less than one hour. It is 4 feet x 9 feet. When the boys were done they named the mural "The Eye." Maybe they were asking to be seen; maybe they were looking at eachother for the first time.